i think if a song has lyrics inserted the checked box shoud be disabled. The reason it's not disabled is because some songs have accompanying "lyrics" in the liner notes despite being instrumental. "Já je proto proti" by !T.O.O.H.! is a good example. Forgive me if this has been brought up before, but has any thought been given to an alternative naming of the status "Split up" for solo projects? As it stands, it kinda sounds like they've disemboweled themselves, which is quite metal, but nonetheless... probably not the best way of putting it. Defunct and disbanded were suggested before. I'd love to be able to search by release date. Albums released on 7 November 1978... etc. The advanced search function allows you to search for a particular month and year, and it should be relatively easy to sift through the list for a particular day. Not much listed for Nov. 1978. I think the problem is that the numbers of "Formed in (year)" and "Years active" are different, check the modification history (user UltimateInsanity): https://www.metal-archives.com/history/ ... ilter/data. Edit: Thanks, Antioch. I've been so stupid lately. Last edited by 0th on Mon Oct 30, 2017 8:51 pm, edited 2 times in total. Removed. It can't be removed by removing the year then saving. You need to press the bin button on the right, Zeroth. EDIT: @0th: We all have our off days. Yours are definitely fewer than mine. I know it's only a minor issue, but it's weird. How did my report on a bandpage get flagged as requiring moderator attention when there's no indication of anyone pressing the button? I never pressed, and the option is still there. Screenshot. On this same subject, is there likely ever to be a way to ''untag'' such reports, in case of errors? I've seen a few in my time here. In the gender field for new artists, could the "unknown/other" option be split so that non-binary/genderqueer musicians can be properly accounted for? I'm hoping to suggest a change to an artist's profile, and that really doesn't sit right. Like, I know for certain what their gender identity is - it just isn't male or female. Re-read this, and felt I needed to clarify my request. Instead of "unknown/other" being one option, I felt it should be two. Increasing social acceptance of those who don't identify as either male or female has led to more people being comfortable identifying that way in one form or another. Changing the gender field to how I've suggested above (which isn't perfect, but is a step-up from where it is presently) would assist the metal archives to better capture how this is reflected by artists working in the area of metal music. Not sure if this is the right place to do this, but I want to report a bug. "DataTables warning (table id = 'searchResultsAlbum'): DataTables warning: JSON data from server could not be parsed. This is caused by a JSON formatting error." Is this a client-side or server-side issue? If needed, I can post a screenshot later. EDIT: Same things happens with the band page. Checking the song search as well. EDIT 2: Same thing there as well. Some server issue, apparently. HB is working on it. @perzine: I would be on board with splitting it. That's very encouraging to hear - thank you. I look forward to seeing this change come through. It's done exactly the same with one of my other reports. However, when I look in the queue and log out, it's normal. It must just be a bug with our own reports. A bit bizarre, although not really a huge issue. Noticed something weird with this album. It had one review which has since been deleted, but the limited edition's page still says "1 review (avg. 90%)" despite said review no longer existing, and the link to said review is obviously broken. I don't know if this has happened to any of you as well, but apparently, there is a glitch on this site that, when you're particularly unlucky, makes you add Links twice. Did this ever occur before? Can it be fixed? There's nothing to fix. When you click on "save", you need to wait. Hitting the save button twice will often, if not always, result in a duplicate. Is Hellblazer likely to split the "unknown/other" gender category option into two categories - "unknown" for properly not known, and "other" for genders other than male/female - anytime soon? My suggested seemed to get a thumbs up a few months back, but on recent inspection it hasn't changed. Yes, I think it would be a good change too. Well, after you brought it up I mentioned it to HellBlazer. Maybe it slipped his mind. I can ever so gently poke him again about it. That'd be swell - thanks. Lineup section for splits has a little imperfection. I found it filling line-up for this split. 1. Deflore side mixed by Andrea Secchi and mastered By Eraldo Bernocchi. first string here is ok, but Eraldo Bernocchi been already added to "Miscellaneous staff" section for Deflore couldn't be added for the second band, there's a dropdown list where I can only add him to one of the bands. Yes, this is known. Modify the role credits themselves to account for this, like, Mastering (tracks 1-6). Just credit the artist as normal. System asks: "This artist belongs to which band from the split?" Yes, and you should just choose the top one. The role itself (tracks 1-6) will refute that anyway, but just go with it. The artist made the artwork for "both bands" but there are not two separate artworks, so just add him like normal. 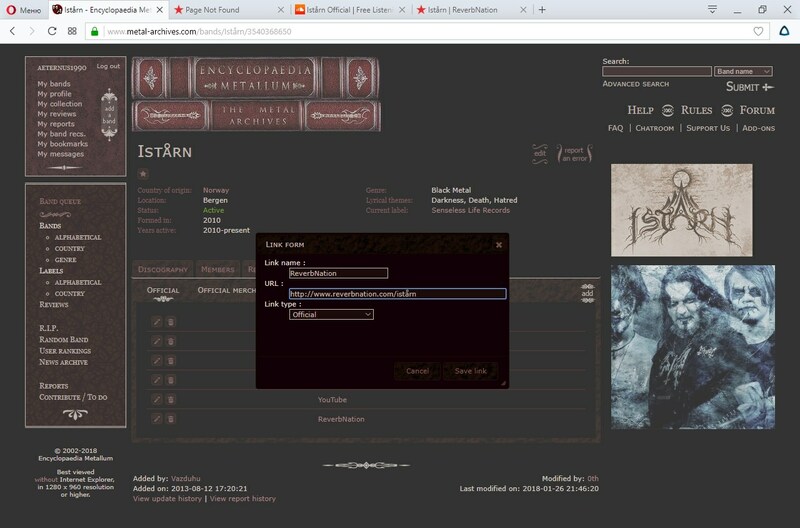 On the artist page, in the band membership list, some albums are duplicated in the discography. In the following case, the discography seems to list the album main entry, as well as another edition, which is a "Special edition" (the number in the table row element id for the duplicate row matches the id in the page url for that edition, 562888). It's only like 5 years late, but perhaps it's time to update the FAQ tab for finding the pending submissions queue. It makes a snarky joke about it being hard to find cause it's not on the left menu, but since we switched to V2, it's been there, in a fancy red font, no less. I've been using this site a lot using chromebooks both that I own and that are provided by my school. I have repeatedly noticed an issue (possible bug) that is not present when using Mac or Windows. It seems when I add a link for a band/artist or add an artist to a band/album lineup, the pop-up window becomes invisible. For example, when I try to add a link to a band, the window appears normally until I write "Bandcamp" in the title, but then the rest disappears and only the outline can be seen. It is still possible to click the "Save" button or whatever, I just can't see it. I've been having this problem since I joined the site in October, and on at least ten different computers. Do you think it might just be a Chromebook thing? 'Cause I know for sure it doesn't happen on other computers. That is a issue with Chrome itself. Interesting. The problem isn't there when I use chrome on Windows. I found... not a bug, but an aesthetic issue. See this: https://www.metal-archives.com/artists/ ... _tab_guest Lilith provides guest vocals for Gurut on a split. 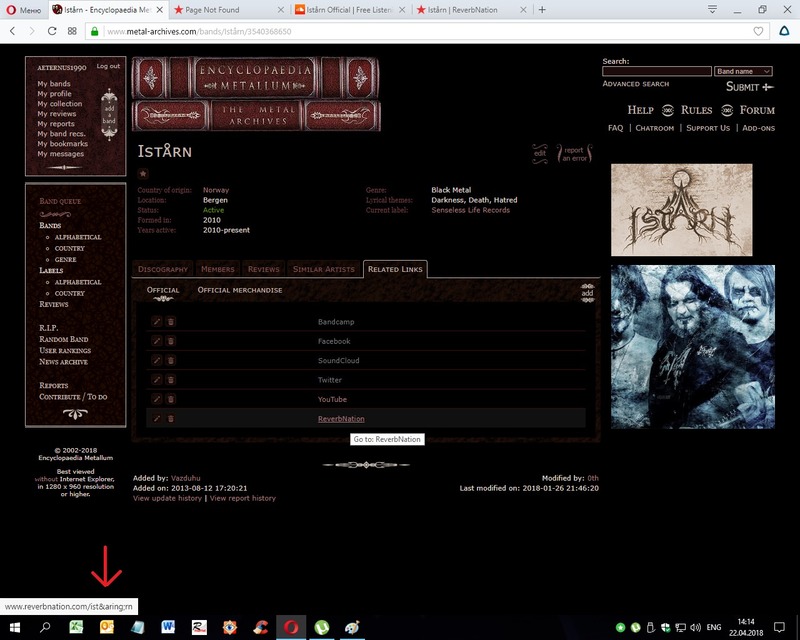 But when we go to the split's page here, and click on the Guest/Session section of the lineup, there's no indicator of which band on the split Lilith did the guest vocals for. There need to be headers for the band names in the Guest/Session tab, just like there are for main lineups on splits. It's been stated before that this is a bug/issue by Porman, and that they've brought it up for correction. I know it used to have band tabs in the Guest and Misc fields, but they went away some years ago. Hey guys, getting this error message when trying to search an artist/band/label to add to a release's lineup and/or additional notes. Searching on the main site wont get me anywhere beyond the "Searching, please wait..." page. Last edited by PaganiusI on Sat Mar 17, 2018 7:47 am, edited 1 time in total. Searches are down right now, for whatever reason. Admins have been notified. Any updates from Hellblazer on where they're at around splitting the "other/unknown" option in the gender field for artists (ie: instead having two discrete options - "other" and "unknown")? It's been a bit over two months since the last update from a mod (and nearly six months since the first positive response from a mod), and no changes have gone through. I don't know if it's a known issue but when you try to add a link that contains letters with umlauts these letters transform into different symbols and as a result the link leads to a 404 page.